Fresh and airy apartment, on a 2nd floor, with sun most part of the day, just one street away from the beach. Supermarket and bakery are two doors down! The flat of approximately 100 m2. It has a large living-dining room with wall-to-wall windows that allow the entry of light and sun during big part of the day. These windows separate the dining room from a large balcony-terrace that face the street. The flat also has a full bathroom with shower and a toilette for best convenience. 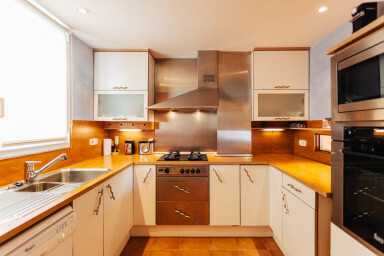 There is a very comfortable kitchen, with oven, microwave and a really equipped cooking-tool set. At the end of the hallway there is a staircase that lead you to a large and airy open space pertaining to the building, where you can put out the clothes to dry or sunbathe with total tranquility. The house is located between two enabled parking areas, more or less at the same distance respectively, about 150 meters from the accommodation areas. All very clean and spacious. I would suggest a manual for using the cooker and washing machine etc which were a little complicated. Apartamento cercano a la playa, limpio y cómodo. Como sugerencia deberían cambiar las sartenes que estan bastante viejas y no se puede cocinar. Por lo demás recomendable para pasar unos días en familia. Appartement conforme à la description, très spacieux et bien équipé. L'emplacement est parfait, proche de la plage. Il y a un peu de bruit le soir côté rue mais l'arrière de l'apparl'appartement est très calme. Merci pour ce séjour réussi ! Sunny apartment, very near to the beach, much space, well equiped, good organized. We had a good time. Très bel appartement, idéalement placé. excellent accueil du propriétaire. Apartment was nice, spacious and clean. But why do you have to install an app, which then does not work properly. Molt cèntric, acollidor, net i ordenat. It was an extremely noisy apartment: on a main road with early bin lorries and very late restaurant customers (till 2.30am!). Not helped by drilling going on through the day (house renovations below?). Desperately needs air conditioning (bedrooms got unbearably hot) and different bed-clothes: 100% polyester sheets plus plastic mattress cover created an oven-like effect which lasted all night. We’d wake up after a very poor night’s sleep dripping in sweat! Lounge area is big, but balcony wasn’t worth sitting on (overlooking the busy road). Sofa was OK but long bench with foam cushions and fleece covers was very uncomfortable. Tamariu was beautiful but there must be better places to stay. Communication was also very poor. Despite many attempts by us to get the lock-box code for the keys, they very reluctantly told us over the phone when we finally got hold of them. They kept referring us to their App which didn’t work properly. Despite paying in full over three months before via booking.com we kept being told we hadn’t paid. This turns out to be because they can’t claim the money from booking.com till after check-in. However, they should have explained that to us in reply to one of our many emails rather than referring us to their non-working App. It’d also be good if they supplied some information about the place (parking, bins etc.). Also note that parking is very difficult - we ended up parking on the road up the hill from the apartment (unrestricted); but beware - our hire car was damaged when the wing-mirror was broken off on Saturday morning!